2018-10-13 - Adair County Ambulance Service, 906 Westlake Drive, Columbia, KY 42728 - Photo by Rita Bragg. 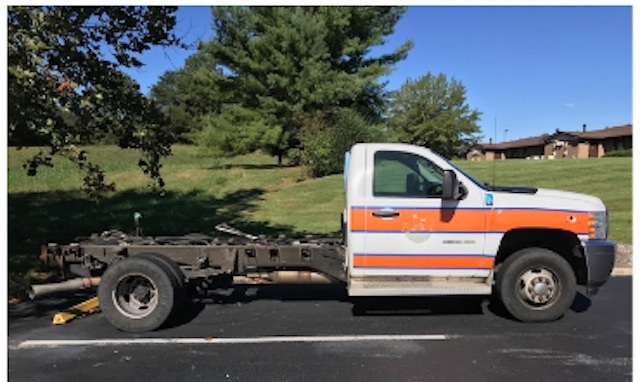 (Ad) The Adair County Ambulance Service is accepting sealed bids for the sale of a 2011 Chevy 3500 HD 4x4 cab chassis Ambulance The Adair County Ambulance Service is accepting sealed bids for the sale of a 2011 Chevy 3500 HD 4x4 cab chassis Ambulance, does not run (the CP3 pump is out). The truck has approximately 145,000 miles on it. The truck can be seen at the ambulance service building during the hours of 8amCT to 4pmCT Monday through Friday. Bids need to be turned in by 4pmCT on Monday, November 12, 2018 at the Adair County Ambulance Service, 906 Westlake Drive, Columbia, KY 42728. For questions, call 270-384-4706. Adair County Ambulance Service reserves the right to refuse any and all bids.